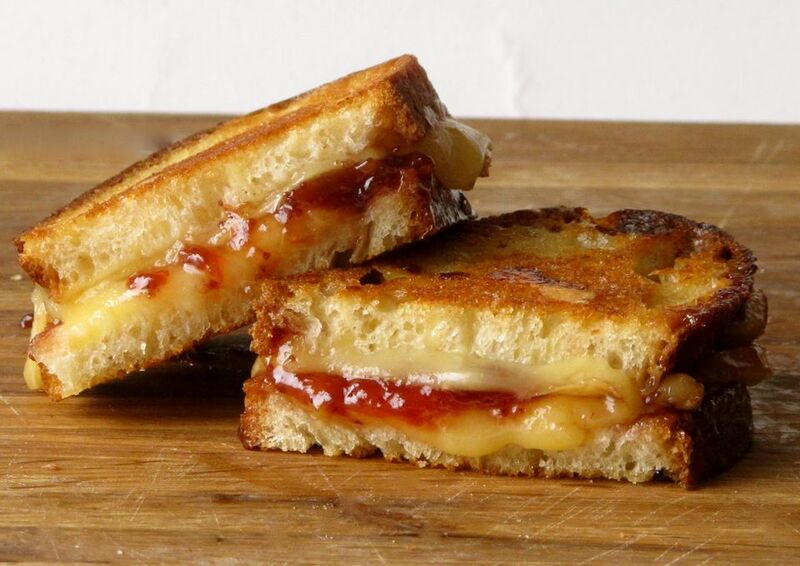 What you have here is one of the finest Polish grilled cheese ideas of all time. This cheese is unlikely to have ever been attempted on American soil, so this is groundbreaking stuff right here. This particular cheese is called Oscypek (pronounced: Ozlsg@qyhdypekek). It’s a delicious smoked cheese made of salted sheep’s milk from the Tatra Mountains region of Poland. I plagiarized that straight out of Wikipedia... sorry, not sorry. Please feel free to explore more fascinating deets here. I discovered this seductive brine-soaked, 14-day-smoked bundle of goodness last year when I visited Kraków, Poland. Yeah, that’s right. I do things like GO to Kraków. Begin by adding a few slices of Oscypek to one slice of bread. Dot the top of it with the strawberry jelly and add the rest of the cheese. Put the remaining piece of bread on top and butter the exterior of the sandwich. Set aside. In a small frying pan, turn the heat to medium and once it's hot, add in your buttered sandwich. Cook for a few minutes on each side until all the cheese has melted and a beautiful golden brown crust develops. Flip and repeat on the other side. When both sides have been grilled, remove the sandwich from the heat and let it sit for a few minutes until the cheese starts to thicken up.